Fire-roasted tomatoes, lean ground turkey or beef and spices are simmered then served over fresh raw zucchini noodles for a healthy spin on a classic pasta dish. Getting little ones to enjoy vegetables can be a frustrating task. Using a spiralizer was an easy and healthy way to fool my kids into eating vegetables by creating these zucchini noodles. What kid doesn’t like pasta? Since the sauce in this dish is warm, I didn’t cook my zucchini noodles, but you can heat them in the microwave or lightly saute in a pan to warm them up. If you are a vegetarian, try mixing in crumbled tofu or tempeh to keep this meal vegetarian-friendly. In a pot over medium heat, add the olive oil, onions and garlic, cooking for 5 minutes or until the onions are translucent and soft. Add in the ground turkey and use a spoon to break up the turkey so that it cooks completely and is no longer pink. Once the turkey has cooked, add the can of fire-roasted tomatoes, Italian seasonings, fresh basil and season with salt and pepper. Stir the sauce and bring to a simmer. Reduce the heat to medium low and cover, allowing the sauce to continue to simmer for 30 minutes. To prepare the zucchini noodles, wash and dry each zucchini. Using a spiralizer, place the zucchini into the machine and turn the handle to create the noodle. Sprinkle lightly with salt to season. 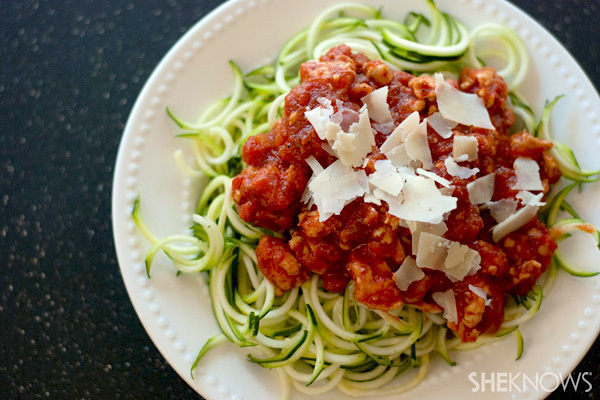 Divide the zucchini noodles between 4 plates and top with the warm Bolognese sauce. Garnish with freshly shredded Parmesan cheese and serve immediately. You can purchase a spiralizer online or at most cooking stores. If you cannot locate one, a julienne peeler also works well to create these noodles.